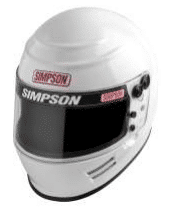 Simpson Performance Products has recently discovered a potential safety issue with its Snell SA 2015 Voyager 2 helmet. If the helmet’s chinstrap experiences large tensile forces during an accident, it could detach from one or both sides of the helmet. This presents an enhanced risk of injury to the head should the helmet not be retained in a crash. Simpson Performance Products is voluntarily recalling the Snell SA 2015 Voyager 2 helmet due to the chinstrap’s potential inability to withstand load forces on a consistent basis. The problem was discovered during testing with the Snell Foundation. We stress that no problems have been reported from the field in nine months of use but in the interest of racing safety, we are proactively recalling these products and providing our customers with a safe resolution. This recall applies to the Snell SA 2015 Voyager 2 Model only, sizes Extra Small – Large with manufacturing dates in 2016 only (the only sizes sold and available to date). It does NOT apply to any other Simpson helmet models with Voyager in the name, i.e. NOT Snell SA 2010 Voyager or Snell SA 2010 Sidewinder Voyager, etc. It is only the Snell SA 2015 Voyager 2 helmet as pictured here.